To find out your ankle-brachial index, a technician measures the blood pressure in your ankle and your arm. The ankle-brachial index can help your doctor check for peripheral artery disease (PAD). The ankle-brachial index test is a quick, noninvasive way to check for peripheral artery disease (PAD). The disease occurs when narrowed arteries reduce the blood flow to your limbs. PAD can cause leg pain when walking and increases the risk of heart attack and stroke. The ankle-brachial index test compares the blood pressure measured at your ankle with the blood pressure measured at your arm. A low ankle-brachial index number can indicate narrowing or blockage of the arteries in your legs. You may have ankle-brachial index testing before and immediately after walking on a treadmill. An exercise ankle-brachial index test can assess the severity of the narrowed arteries during walking. The ankle-brachial index test is done to check for PAD — narrowed arteries that reduce blood flow, usually in your legs. Research indicates that PAD affects about 10 percent of people over age 55. 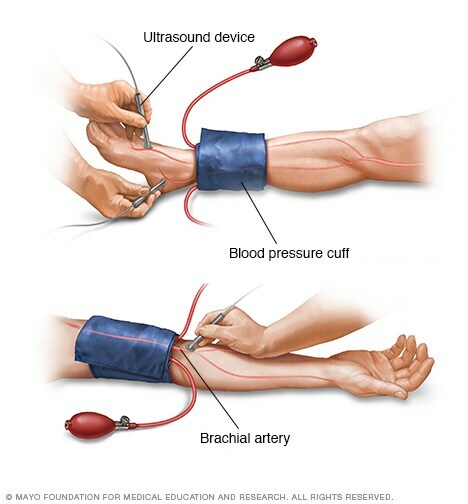 You may feel some discomfort when the blood pressure cuffs inflate on your arm and ankle. But this discomfort is temporary and should stop when the air is released from the cuff. If you have severe leg pain, your doctor may recommend a different imaging test of the arteries in your legs. Generally, you won't need to follow any special instructions before your appointment to have an ankle-brachial index test performed. You may want to wear loose, comfortable clothing that allows the technician performing your ankle-brachial index test to easily place a blood pressure cuff on your ankle and upper arm. You likely will be asked to rest for 5 to 30 minutes before the test. Typically, you lie on a table on your back, and a technician measures your blood pressure in both arms and both ankles, using an inflatable cuff and a hand-held ultrasound device that's pressed on your skin. The device uses sound waves to produce images and allows your pulse to be heard in your ankle arteries after the cuff is deflated. The ankle-brachial index test should take only a few minutes. You don't need to follow any special precautions afterward. Your doctor will discuss your test result with you. Your doctor uses the blood pressure measurements from your arms and ankles to calculate your ankle-brachial index. No blockage (1.0 to 1.4). An ankle-brachial index number in this range suggests that you probably don't have PAD. But if you have symptoms of PAD, your doctor might perform an exercise ankle-brachial index test. Borderline blockage (0.91 to 0.99). An ankle-brachial index number is this range indicates that you have borderline PAD. Your doctor might recommend an exercise ankle-brachial index test. PAD (less than 0.90). An ankle-brachial index number in this range is considered abnormal and indicates a diagnosis of PAD. Your doctor may recommend additional testing, such as ultrasound or angiography, to view the arteries in your legs. If you have severe diabetes or significantly blocked arteries, your doctor may need to read your blood pressure at your big toe (toe-brachial index) to get an accurate test result. What is peripheral arterial disease? National Heart, Lung, and Blood Institute. http://www.nhlbi.nih.gov/health/health-topics/topics/pad/#. Accessed July 23, 2015. Mohler ER, et al. Noninvasive diagnosis of arterial disease. http://www.uptodate.com/home. Accessed July 22, 2015. AskMayoExpert. How are the results of ankle-brachial index testing classified at Mayo Clinic? Rochester, Minn.: Mayo Foundation for Medical Education and Research; 2015. Conte MS, et al. Society for Vascular Surgery practice guidelines for atherosclerotic occlusive disease of the lower extremities: Management of asymptomatic disease and claudication. Journal of Vascular Surgery. 2015;61:2S. Ankle brachial index: Quick reference guide for clinicians. Journal of Wound Ostomy and Continence Nursing. 2012;39:S21. Litin SC (expert opinion). Mayo Clinic, Rochester, Minn. July 24, 2015. Mankad R (expert opinion). Mayo Clinic, Rochester, Minn. Aug. 7, 2015.